Today we interview Christina Thompson, professional trombonist and co-owner with husband Andrew Munger of Summerglen Music. 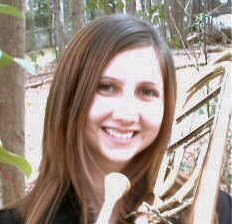 In addition to performing and teaching trombone, Christina also leads a salsa band, The Tropic Orchestra, arranges music, leads creativity workshops and speaks on musical and creativity-related topics. Her enthusiasm for sharing the joy of music and the fun of the creative process is infectious! Christina: My favorite creative pursuit is music. I’m a professional trombonist, and I’ve been playing for 17 years in a variety of styles. I’ve played in groups ranging from punk bands to symphony orchestras to jazz combos, and I love learning how to bring out the specific elements of each style, while making the music my own. 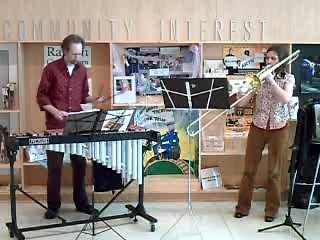 Teaching music is also one of my favorite creative pursuits–I taught school band for five years and have been teaching trombone privately for about 7 years. Teaching is so invigorating, because you get to draw from your entire experience to help others solve their problems. Whereas a painter mixes colors to create the perfect shade, I mix exercises and techniques to release a student’s inner musical abilities. I also enjoy writing, making visual art, and taking random classes in stuff I don’t know much about. I love being a beginner and having fun being creative–it makes my music and my life much more exciting! Christina: I have a great deal of musical training, and it’s been very important to my development as a musician. I was classically trained on trombone, and earned a master’s degree in music education. This type of training really helped me because I’m naturally VERY left-brained, and it gave me the structure I needed to make sense of the trombone and music. Through training, I also learned to teach myself. When hurdles come up, or there’s a new style to learn, or I feel pulled to explore something new, I seem to intuitively know how to proceed. Even though formal training has been important to my musical development, the really creative things have happened when classes weren’t in session–when I had plenty of time to start tinkering with everything I’d learned. Stepping away from my teachers and doing my own thing kicked my creativity into high gear. In fact, messing around after lessons seemed just as vital as going to the lessons themselves, because it was working on a completely different (but very necessary) set of skills. So I enjoy balancing training and experimenting. Experimenting opens your mind, and training makes it easier to make your ideas into reality. Christina: More than anything else, respecting myself keeps the creativity flowing. I make sure to honor my natural clock by being willing to rest when I’m tired, and to take care of myself by eating well and exercising. I also follow the advice of Julia Cameron, the author of “The Artist’s Way,” and write, uncensored, first thing in the morning as often as I can. Doing this writing is like turning my head over and dumping it out. I pour out all the fears, worries, and other rotten stuff, and the ideas flow freely! Also, changing up the routine supports my creative flow in a big way. After going for a walk or spending the day at a museum, I often notice my playing is better, and that I have all kinds of new ideas. Christina: First of all, listen to what’s going on inside your head. When I feel blocked, I notice that my inner critic is running rampant in my mind, saying stuff like, “You’ll never be a good musician, so you should just stop trying.” It helps me to listen to what my critic is saying, and then write the opposite ten times. Also, practice appreciating yourself and your own sound, instead of comparing yourself to others. It’s easy to start beating yourself up because you don’t play like someone else. When you feel yourself slipping into comparisons, make yourself stop and refocus your thoughts on your own strengths. Using practice wisely can pull you out of a creative rut as well. Successful practice focuses on the process rather than the product. When I practice improvising, sometimes I sound great, and sometimes the results are hideous. But no matter what it sounds like, the act of being creative with my trombone makes me a better player and brings out new connections and ideas. Christina: I’m really excited about my summer trombone choirs for kids. I’m arranging and writing much of the music myself, and it’s an exciting challenge to get the arrangements just right to respect the students’ experience and push them to develop as musicians. I feel like Duke Ellington, tailoring parts to fit each player, while at the same time highlighting our unique sound as a group. And after the arranging comes an even more fun part–finding the best approach to take each choir member to a higher level of playing. I love detailed, nuanced, gradually evolving work–and this is IT! Christina: I have this natural tendency to always churn out new ideas, so I end up with this huge list of creative things I want to do. When I get a new idea, I think of how much time it’ll take to execute it, and what resources I’ll need to make it happen. If it seems like now’s the time to do it, I jump right in and start planning. If not, I write it down so I’ll remember it, and come back to it later. The projects I enjoy most are those that are new and different from anything that’s being done in my area. I get excited about introducing people to innovative ideas, or putting a creative spin on something familiar and bringing a new perspective to the community. Christina: Be sure to take good care of yourself and make time to be creative every day. The more you exercise your creative muscles, the stronger they will be!